Film and Music of the Frieze Art Fair London 2012. Frieze Art Fair London 2012 has presented a curated programme of Talks, Artists’ commissions, Film and Music projects, supported by Frieze Foundation, together with Outset Frieze Fair for Tate Collection. Frieze Art Fair London 2012 was organised on the main gallery section, Focus and Frame sections and the newly inaugurated Frieze Masters. Furthermore, as a part of Frieze Fair, the Sculpture Park was organised. Frieze Music was established to develop the crossover between contemporary art and music. Frieze Music was originally created by Dan Fox, Senior Editor of Frieze Magazine, and Steve Mackey, producer and musician. Frieze Music’s varied programme has featured bands, avant-garde classical composer Karlheinz Stockhausen and pop series, such as that co-ordinated by Franz Ferdinand in 2004. Frieze Music has taken place during the week of the fair and attracted a wide audience. Frieze Film is a programme of artist films screened to coincide with Frieze London. Curated by Sarah McCrory, this year’s commissions included five new films. The whole programme at Frieze Art Fair London 2012 was curated by Sarah McCrory, who did it also in 2011 and 2010. The artists commissioned to make new work for Frieze Film are: Bertrand Dezoteux, Patricia Esquivias, Jimmy Merris, John Smith and Wu Tsang & Nana Oforiatta-Ayim. This year’s commissioned artists presented a range of film-based practice that deals with ideas including those of history and memory, be it personal or collective. The way narrative is conveyed and constructed around individuals, buildings or objects and place is a theme that runs through the programme via imagined journeys, fictitious events and romantic relationships. Frieze Film is commissioned and produced by Frieze Foundation. 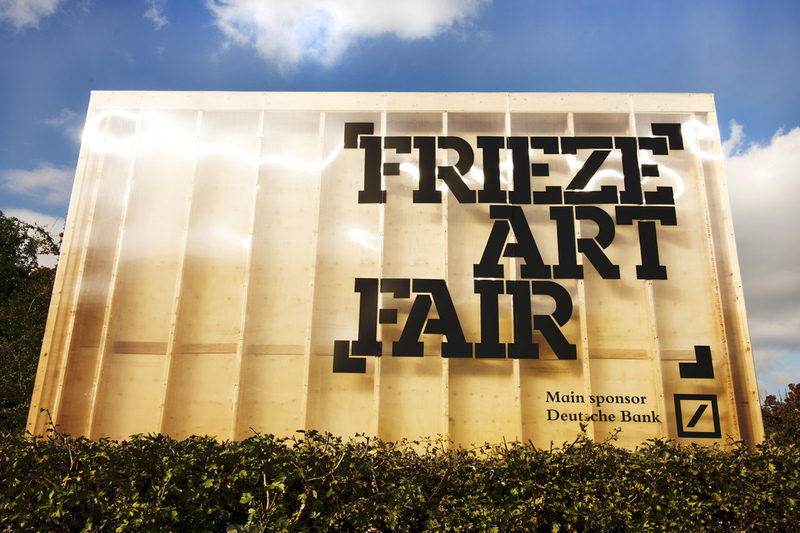 The tenth edition of Frieze London is sponsored for the ninth consecutive year by Deutsche Bank. Bertrand Dezoteux (b.1982) is a French artist based in Bayonne. Recent solo shows and projects include ‘Txerri’, le Carré, Bayonne (2012); ‘Le Corso’, Palais de Tokyo, Paris (2010) and ‘Roubaix 3000’, Espace Croisé, Roubaix (2007). Group shows include: ‘Low Mountains’, Dar Bellarj Foundation, Marrakech (2012); ‘Dynasty’, Palais de Tokyo et Musée d’Art Moderne de la Ville de Paris, Paris (2010) and ‘Reset’, Fondation d’Entreprise Ricard, Paris (2010). Forthcoming shows will be at FRAC Aquitaine, Bordeaux (2012) and Sala Rekalde, Bilbao (2012). Patricia Esquivias presented a video that revolves around a specific apartment block in Madrid that dates from the late 1950s and has decorative tiles on its façade and balconies, featuring a different pattern for each apartment. In this new work, Esquivias will try to read the building like a book; to sit in privacy and work out what happened in this specific building. She imagines situations which she hopes actually took place, weaving them into the images of the building – but usually the reality that she finds does not match her fantasies. Patricia Esquivias (b.1979) is a Venezuelan artist based in Madrid. Recent solo exhibitions and projects include Hammer Projects, Hammer Museum, Los Angeles (2011); ‘Todo lo que no es ración, es agio’, Museo Nacional Centro de Arte Reina Sofía, Madrid and ‘Reads like the Paper, 2005-2009’, Midway Center for Contemporary Art, Minneapolis (both 2009). Group exhibitions include: ‘Stories in Between’, Stiftelsen 314, Bergen; ‘LifeStories’, Museum of Contemporary Art, Detroit, (both 2011); ‘Les Faux Amis’, Galerie Nationale du Jeu de Paume, Paris (2010); and ‘Younger than Jesus’, New Museum, New York (2009). Jimmy Merris will make a new video work by using a bamboo stick with a camera sellotaped to its end – an improvised steadicam. The work will be shot in and around his studio in south London and will be the first time the artist has filmed outside the studio for an extended period, but will still encompass his typical ad-hoc production methods; ‘the camera will then move back inside, perhaps through an open window, to record a series of domestic interiors, a new set of portraits, and joyful encounters with friends, neighbours, animals, and familiar objects which are just kicking around the yard here in South London’. Jimmy Merris (b.1983) is a British artist based in London. Recent solo exhibitions include ‘Deep Joy on Home Soil’, Studio Voltaire, London (2012), ‘Economics 101’ (with Terry Dennett), SPACE, London and ‘Finding Your Feet In The Times Of The Worried Man’ Seventeen Gallery, London (both 2011). John Smith’s film, Three Things begins with three objects shown to him by his father shortly before he died. Two of these were well-used objects that had become so steeped in history that their original forms and functions were almost completely obscured. A third object seemed to be instantly recognisable, but it turned out to be something else entirely. Taking these ambiguous artefacts as its starting point, Three Things will create a dialogue between abstraction and literal meaning, exploring the contradictions of memory and history to hint at the perceived character of a dead father and his relationship with his son. John Smith (b.1952) is a British artist based in London. Recent solo shows and projects include ‘Horizon’, Turner Contemporary, Margate (2012); ‘Bildstörung’, Kestnergesellschaft, Hanover (2012); ‘Worst Case Scenario’, Weserburg Museum of Modern Art, Bremen (2012) and ‘unusual Red cardigan, PEER, London (2011). Group shows include: ‘Image Counter Image’, Haus der Kunst, Munich (2012); ‘Locus Solus: Impressions of Raymond Roussel’, Museo Reina Sofia, Madrid (2011) and Serralves Museum, Porto (2012); ‘Descriptive Acts’, San Francisco Museum of Modern Art (2012) and ‘Has the Film Already Started’, Tate Britain, London (2011). Forthcoming shows include Ferens Art Gallery, Hull (2012) and Espai, Barcelona (2012). Wu Tsang & Nana Oforiatta-Ayim will present a short film that explores narratives of inclusion and otherness in a world in which relativity has liberated our sense of difference, de-centered the margins, and where, paradoxically, inequality and racism are more prevalent than ever. The film is set in a hybrid landscape made up of St Louis, Senegal and Los Angeles, USA and inspired by films including Douglas Sirk’s All That Heaven Allows and Rainer Fassbinder’s Ali: Angst Essen Seele Auf. The main characters include a Senegalese royal and a British working-class interloper. Their love, illicit in the eyes of the world, at first triumphs, then falters, the pressures of the outside world internalised, leaving us to question whether the equaliser of love and connection can win out against the constructions of difference and self. A Frieze Film & UKS Co-Production. Wu Tsang (b.1982) is an American artist based in Los Angeles. Recent group exhibitions include ‘The Whitney Biennial 2012’, Whitney Museum of American Art, New York; ‘The Ungovernables: The 2012 New Museum Triennial’, New Museum, New York (both 2012) and ‘Performa 11’, New York (2011). His recent feature film, Wildness, world premiered at MoMA’s ‘Documentary Fortnight’, Museum of Modern Art, New York (2012). Tsang is a 2012 Louis Comfort Tiffany Fellow and has received support from the Good Works Foundation, Frameline, the Wexner Center for the Arts, the IFP Documentary Lab, Art Matters, and the Andy Warhol Foundation for the Visual Arts. Nana Oforiatta-Ayim is a writer, filmmaker and cultural historian, currently based in Senegal. Her work has been presented in ‘The Ungovernables: The 2012 New Museum Triennial’ New Museum, New York (2012); the Neue Gesellschaft für Bildende Kunst, Berlin; Vela Gallery, London; The Museum of African Diaspora, San Francisco, and will be shown at the Kunstmuseene Bergen, Norway later this year. « Frieze Foundation propped up the art programme of the London Fair 2012.